All of us who’ve children have encountered questions such as “Dad, what’s Avogadro’s number?” or “What makes diamond and graphite different, if they are both made of carbon?” Besides the obvious answer that people seem to prefer to pay a whole lot more for the diamond form of carbon than graphite, our own schooling seems to have prepared us reasonably well to field such questions. Failing which we can always resort to “Go ask your mom” as I am often prone to do. However, as an up and coming professional you can rarely resort to such an answer, when at the company party, the chief financial officer asks you an actual question about online video-based learning and how it’s going to impact your business. Sure you can try to bluff your way through, but that may be a path?fraught with risks. One of the most commonly told stories about Steve Jobs, the visionary leader of Apple, was how his engineers feared being caught in an elevator with him. While Jobs would ride in silence often, he’d just as likely ask the engineer how his project was going. Michael Dhuey, a former engineer at Apple recounts: “If you got on at the 4th floor, you’d better have captivated him by the time you got off on the 1st. Jobs remembered you when you had a great story to tell. He also remembered when you didn’t.” So it would appear it’s not just your kid who likes a good story. I hear you saying, just as not everybody can paint or sing, not everyone can tell a good story. Even if you can’t tell a story quite the way you’ve seen it done in your favourite TED talk, you need to be able to carry on a decent conversation, particularly with strangers you need to network or often with someone in your professional life. Yet much as we read about how public speaking is one of the greatest fears most adults hold—in fact it even tops the fear of death—we hear little about the inability to make meaningful small talk in a professional setting. The funny thing is that Indian parents, might be less so today, are obsessed with their children gaining general knowledge. In fact legions of young people preparing for the Indian government civil service exams can be seen boning up on a wide variety of arcane facts. Even the US, for a couple of decades back in the 1980s, was swept up in the tantalizing game of Trivial Pursuit. You’d think armed with these strange facts, about animals from armadillos to zebus or the national flags of Afghanistan to Zimbabwe, our young ones would be able to scintillate any audience. Yet conversations at business mixers, conferences or just plain old parties seem to be confined to sports (football or basketball in America and good old cricket in India), movies and eventually politics if enough libations have flown. Sure we’ve all run into at least one interminable bore, who can’t stop talking about their favourite topic—be it last month’s sales figures, real estate or the real reason the stock market is not doing well. The fact that this world is getting smaller (and flatter, if you believe some people) complicates the art of conversation, as cultural and gender sensitivities seem to have made making small talk akin to crossing a minefield. So you know what it is that you don’t want to be doing, but how do you figure what is the best way to be interesting and entertaining enough to be memorable and sound smart enough to be invited again at the very least or sought after at best? 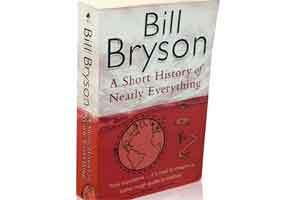 Bill Bryson’s A Short History of Nearly Everything offers an answer. Not only is it a ripping good read, but is probably the best written history of science. Science is not only full of fascinating factoids, but thanks to Bryson’s unique style, sharing of these in the right tone with a trace of humour will make you appear not only smart but nearly human. So if you want to make?it?to the corner?office?or at least to the best mixers in town you’d run out and get your own copy.